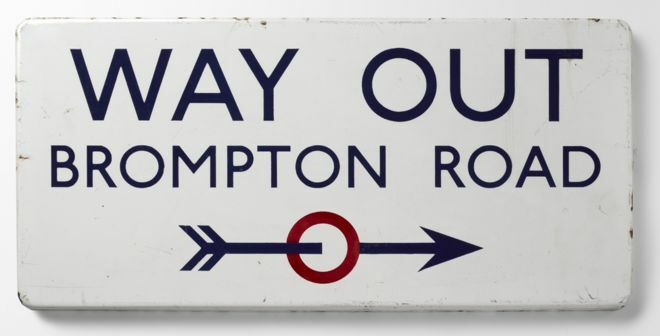 This year we celebrate the centenary of the lettering designed for the London underground by Edward Johnston, a letter without serifs made for fast reading on station signage. It’s one of the classic typefaces, still in use today in a modified form. 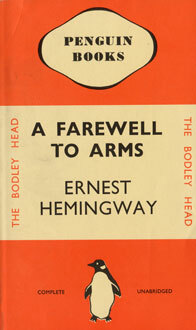 It was developed further by Johnston’s pupil Eric Gill into the famous Gill Sans type, known to everyone from the old orange-back Penguin books (pictured). Johnston’s influence is remarkable because he was a retiring man and notorious for his slowness. His courses at the Royal College of Art and the Central School of Arts and Crafts (now Central St Martins) took students through the letter forms so thoroughly that he didn’t get to the end of the alphabet. His influence went beyond calligraphy to everyday handwiting and he influenced other arts as well. The calligraphic approach to design can be applied to needlework and pottery too. Among his students were Louise Powell and Dora Billington, both of whom made important contributions to the decoration of ceramics – and both of whom were embroiderers as well. 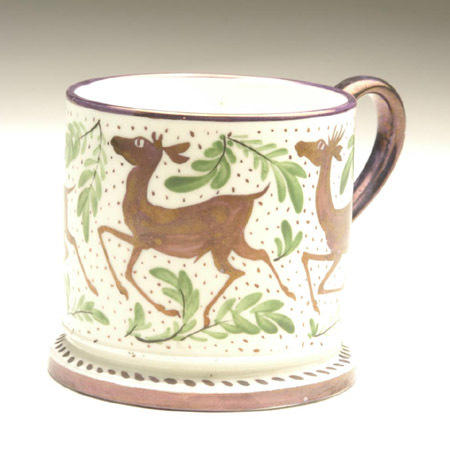 Louise Powell and her husband Alfred Powell brought the Arts and Crafts approach to pottery into the Wedgwood company, where they were firm advocates of freehand decorating rather than stenciling and stamping, which they thought demoralized the decorators. They supervised decorating in Wedgwood’s Stoke-on-Trent factory and had a studio in London as well, in Red Lion Square, where, with a couple of assistants, they decorated Wedgwood wares. Studio potters had a good time after the Second World War. During the war, factory-made ceramics were plain and undecorated because the government considered decoration to be a waste of resources. In peacetime, customers looked for something new and different to put on their table, and for a generation good potters found it hard to keep up with demand. There were fewer potters then, perhaps a hundred in Britain; according to a 2004 Crafts Council survey there were about 6,000. At the time, government thought the crafts had a role to play in the economy and support for the crafts was the responsibility of the Board of Trade. By the mid-sixties it became evident that there was little dialogue between craft and industry, and in the seventies responsibility for crafts passed to the department of education. Pottery was now art, not manufacture. Studio potters had been well represented in the 1951 Festival of Britain and a year later there was a curious exhibition, Ceramics in the Home, in Charing Cross underground station of all places, sponsored by The Observer newspaper. 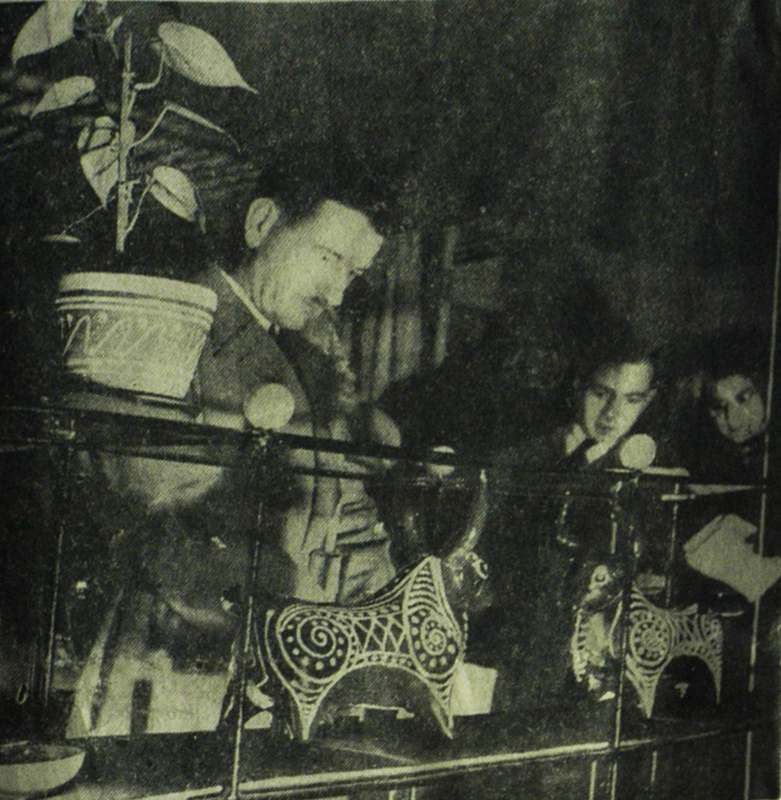 The exhibition featured on the front page in October 1952, with the two photos at the top of this post prominently displayed. 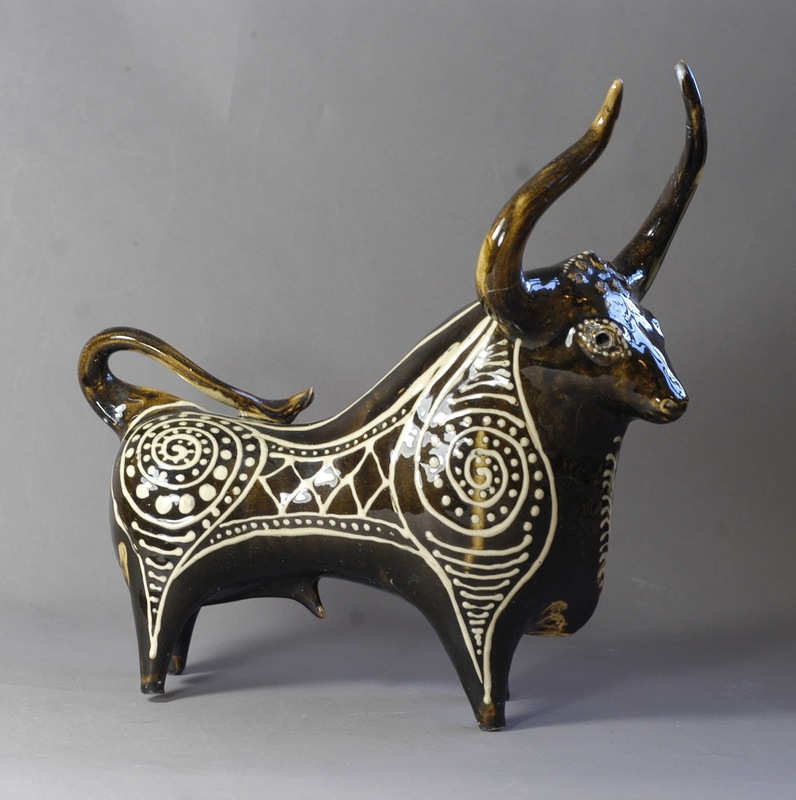 I saw one of Newland’s Minoan bulls (pictured), similar if not identical to the one in the photo, in a private collection. Newland and his wife Margaret Hine had visited Andalucía in 1949, and I think I see a Spanish influence in this bull. Newland recalls that the exhibitors at Charing Cross included Hans Coper, Lucie Rie, Nicolas Vergette, himself and Hine – a strong representation of potters associated with the Central School of Arts and Crafts, where ceramics was under the control of Dora Billington and her assistant Gilbert Harding Green. There was a strong influence of Picasso, whose ceramics had been seen for the first time in London a couple of years earlier. Studio potters had no more sympathy for Stoke-on-Trent than Stoke had for them. Billington was sending her students for a term of work experience in the North Staffordshire Potteries, but not much stuck, and a potter like David Queensberry, who really wanted to work with industry, had to leave the Central and study with Robert Baker at the industrially oriented Royal College of Art. As readers of this blog will have realised, I’m researching how pottery was taught in British art schools in the 20th century. Here’s a very, very brief overview. Practical pottery in Britain was first taught by Richard Lunn at the Royal College of Art (1901-15), then at Camberwell College of Arts and Crafts (1908-15). Alfred Powell introduced pottery painting at the Central School of Arts and Crafts in 1906. Lunn’s and Powell’s inspirations were Arts and Crafts pottery, Iznik and Italian maiolica. W.B Dalton, head of Camberwell College, was a grand feu, East-Asian stoneware inspired potter but he left teaching to Lunn. The grand feu ceramics of Dalton and Bernard Moore in Britain, Charles F Binns and Taxile Doat in the USA, and Ernest Chaplet, Auguste Delaherche and Alexandre Bigot in France – the progenitors of studio pottery – were of little interest to Lunn and Powell. The USA was ahead of Britain. Binns taught grand feu ceramics at the New York State School of Clay-Working and Ceramics from 1900, and Doat introduced it to the Art Academy and Porcelain Works at St. Louis, in 1909. “Studio pottery” was an American term, first used in a review of Binns’s The Potter’s Craft in Keramic Studio in 1910. (If anyone can find an earlier use of the term, I would be grateful for the reference.) Studio pottery was not taught in a British art school until William Staite Murray was appointed to the Royal College of Art in 1925. Bernard Leach’s view of craft training was similar to that of C.R.Ashbee, who advocated workshop training and wrote Should We Stop Teaching Art? (The answer was that art schools should be converted into subsidized craft workshops.) 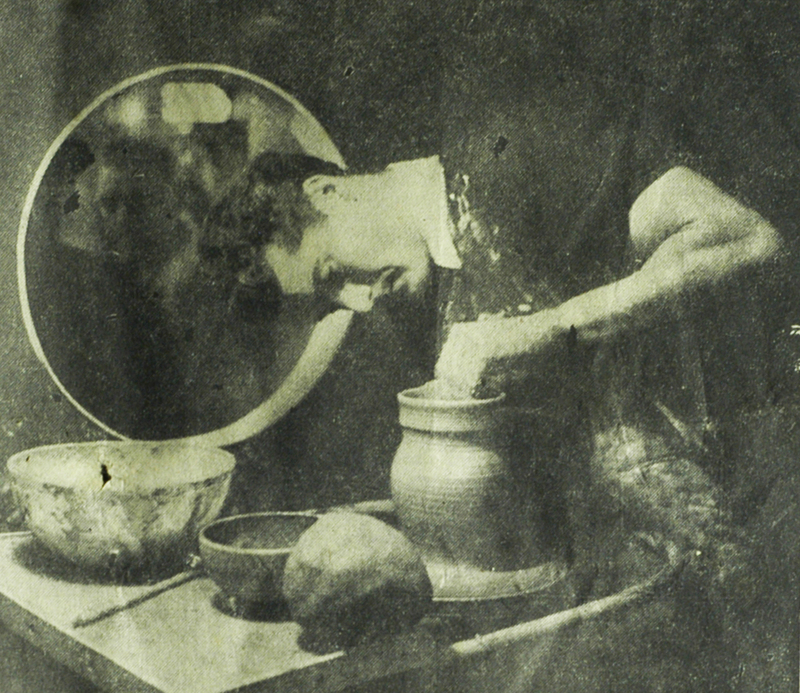 Leach said, “The greater part of art school training does more harm than good,” and the studio pottery movement in Britain developed an anti-art bias. 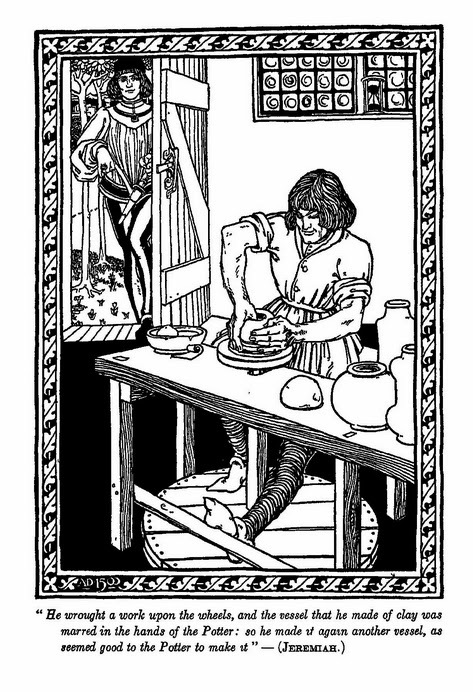 Leach’s apprentice system, central to his craft philosophy, was, however, problematic. Most studios were too small to support unproductive staff: apprentices were never paid much and some actually had to pay for their training. The employment of schoolboys, which was tried for a while, did not work. The apprentice system was unsustainable and so there emerged a pattern of potters getting rudimentary skills in art schools and then going into workshops. By the 1970s, Britain had almost forty full-time art school courses in ceramics. In the 1930s the Central School had flirted with industrial training, but the students did not want to go into industry, and certainly not to Stoke-on-Trent. The Second World War changed everything. 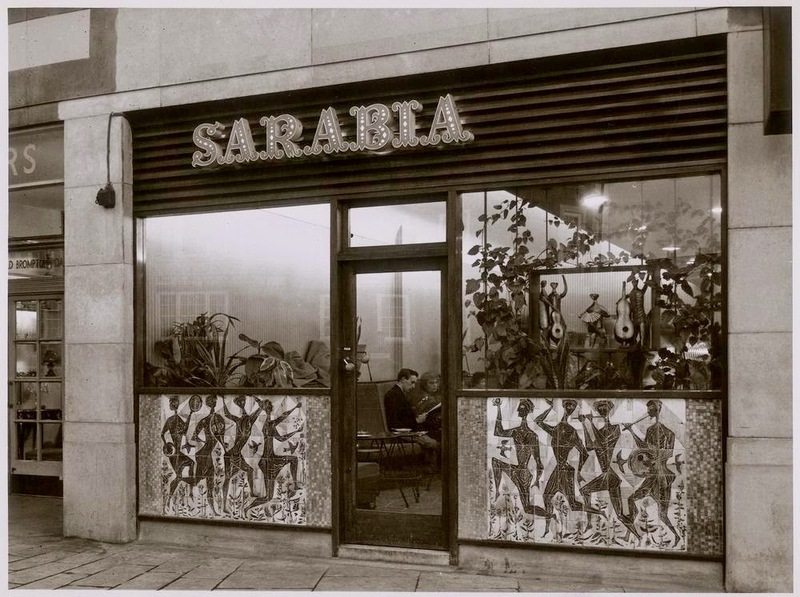 The Central had been bombed and evacuated and in 1945 pottery had to be started from scratch. Dora Billington had taken over as chief instructor with Gilbert Harding-Green as her associate. They became the leading school for art-led ceramics. In 1947 the Central had a dynamic new principal, the painter William Johnstone, who introduced modernism into the fine arts, industrial design in place of crafts, and Basic Design (a Bauhaus-type training) for all disciplines. Out of deference to Billington, who would not countenance industrial design, the pottery course remained craft-based. 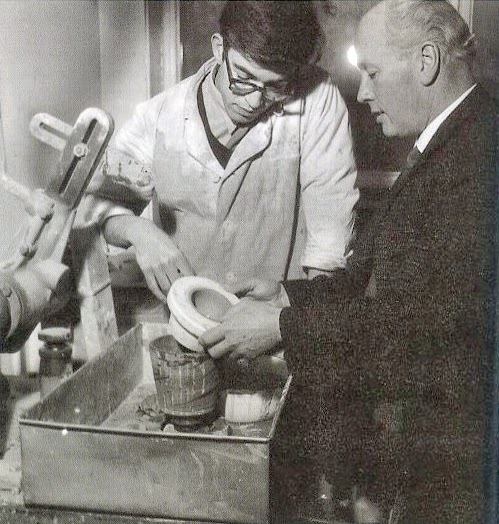 The post war optimism, Johnstone’s reforming zeal, the introduction of modernism and Basic Design, and the need to rebuild the pottery department, all contributed to the ethos of Central ceramics. Picasso’s ceramics, first shown in Britain in 1950, also exerted an influence. By 1951 – Festival of Britain year – Billington had put together the team that would define the “New Look” in ceramics at the Central: Harding Green as her loyal lieutenant, Richard Bateson, a country potter with an extraordinary command of throwing, and two young potters, William Newland and Kenneth Clark, who were outside the Leach orbit. Billington’s approach to teaching was to get the student to discover what he or she wanted to do, give them the means to do it and then make them work very hard. She insisted on high standards, but she did not think there was only one standard. Gilbert Harding Green was head of ceramics at the Central School of Arts and Crafts between 1955 and 1971. After the war, Dora Billington had built the ceramics department, with Harding Green’s assistance, into the most innovative and liberal in the country. At that time the Royal College of Art was teaching design for the pottery industry, Farnham was very traditional and Camberwell was undistinguished. At the Central there was cross fertilization between disciplines and pottery students could work with Eduardo Poalozzi, William Turnbull or Alan Davie. Paolozzi was based in the textiles department, where Terence Conran was studying. The Central was one of the first art schools to teach Basic Design, a generic and analytic approach to both painting and design, derived from the Bauhaus course, that eventually shaped the foundation course in British art schools. Harding Green took over the department on Billington’s retirement and developed it – “beyond recognition” was her approving verdict. He expanded into the school’s new building, and, post-Coldstream, steered the course into the Diploma in Art and Design. His students included Ruth Duckworth, John Colbeck, Robin Welch, Eileen Nisbet, Richard Slee, Alison Britton and Andrew Lord. 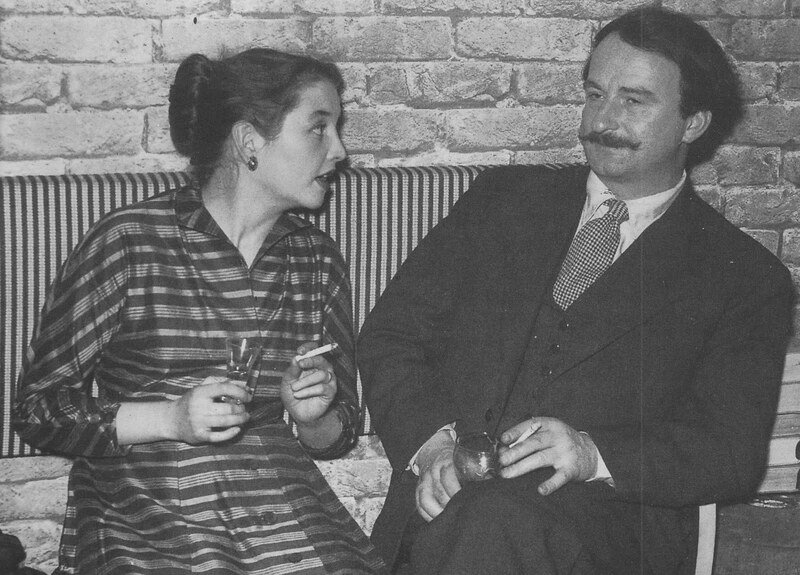 Gilbert Harding Green with a student in the early 1960s. Billington and Harding Green subsumed their artistic careers in teaching, Harding Green the moreso. Harding Green’s origins were exotic. Born in 1906, he was the illegitimate offspring of aristocratic parents, his mother English and his father Dutch or Russian according to differing accounts. Most of his childhood and youth were spent abroad, much of it in Italy. He told one of his students that, while living in the Vatican, he wandered into a room and looked idly into a chest of drawers, which he discovered to be full of marble penises. In his twenties he traveled in Brazil and learned Portuguese. He studied sculpture under John Skeaping and Frank Dobson at the Central School in the 1930s and turned to pottery. Of the little work by him that still exists, most is totally original and does not derive from any obvious ceramic tradition. In 1938 he became Billington’s assistant, beating off competition from Henry Hammond, who went on to head the pottery department at Farnham, and Moira Forsyth, who is now better known for her stained glass. 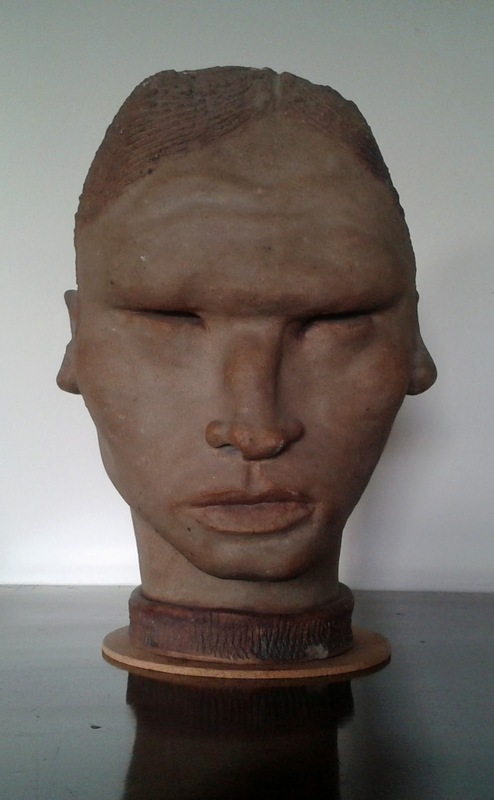 I recently saw this sculpted head in clay by Harding Green, which he exhibited at the Royal Academy with the Arts and Crafts Exhibition Society in 1938. A review of the exhibition said “It held me by its stark truth and brute ugliness – the hard smileless mouth, the hollow cheeks and buried eyes, the repaired nose, the punched ears, and the imbecilic slope of the forehead, and these inelegant features were mercilessly gripped with economy of effort and absolute certainty.” The subject was far removed from the artist’s life. He was a man of wide culture and elegant taste who would attend the ceramics classes in the Central School in a suit, tie and cufflinks, always ready to advise students on a good restaurant or to give away complimentary theatre tickets that he had managed to get hold of. A comment often made by 20th century studio potters is that they embarked upon their craft without any books to guide them. George Cox’s “Pottery for Artists, Craftsmen and teachers” (1914) and Dora Billington’s “The Art of the Potter” (1937) are singled out as exceptions. There were, however, earlier manuals that studio potters could have made use of. 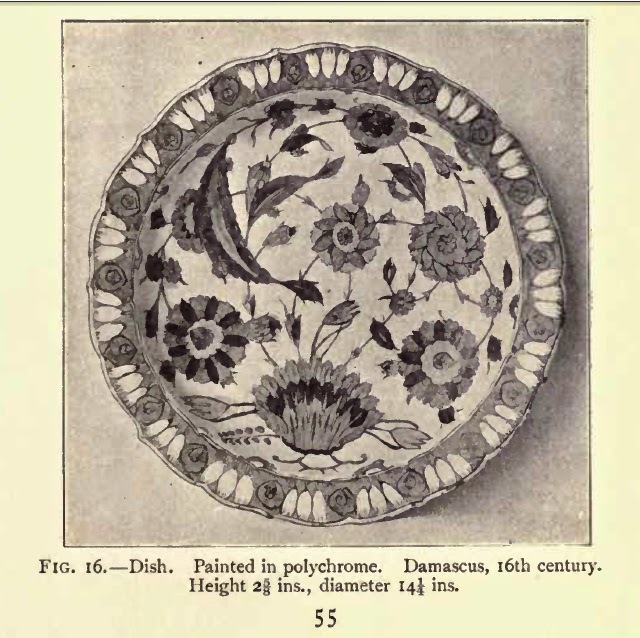 Many served the amateur pottery painting craze of the 1870s, 80s and 90s, but others, particularly those published after 1900, gave a good grounding in pottery making technique and they show that the secrecy commonly supposed to surround potters’ recipes and practices was not universal. Two books known to Billington and to Dora Lunn, another pottery pioneer, were Charles Binns’s “The Manual of Practical Potting” (1901) and Taxile Doat’s “Grand Feu Ceramics” (1905). Binns was British; Doat, at one time employed at Sèvres, was an innovator in high temperature art wares. Both moved to the USA where their careers flourished. 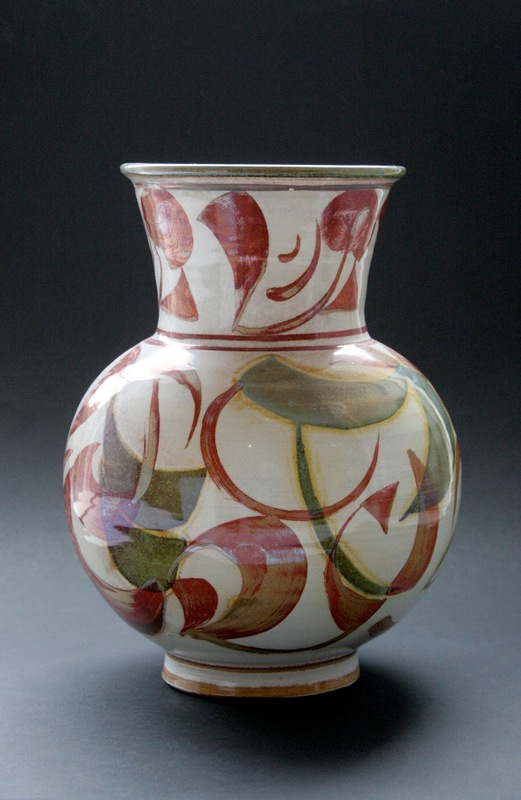 Binns has a claim to share with Bernard Leach the title “Father of Studio Pottery”. Under Binns’s influence there was a major change in art pottery. He wrote: “Certain occupations or so-called crafts have offered easy paths to the unlearned and in consequence, the country has been flooded by the product.” These occupations consisted in copying, and among them he listed china painting, but there was now a feeling that one should create. “This feeling has caused china-painting to give place to pottery-making. The former consisted in buying finished china and painting upon it with ready prepared colors using, probably, some published design or drawing. Some of the work done under these conditions was, and is, good, even excellent … The fact remains that the bulk of the work was copying of the poorest quality. … But the best of these are now looking toward clay as a creative and expressive medium. In ready-made china there is bound to be some deficiency. The artist is by nature exacting and this purchased piece does not entirely please. It cannot be altered, however, and it is this or nothing. Thus the artistic instinct is violated, the standard lowered and one feels like a caged bird beating its ineffectual wings against prison bars. When, however, the attempt is made to work in the clay itself, liberty is found.” Similar changes were occurring in Britain under the influence of W. B. Dalton, principal of Camberwell School of Arts and Crafts and a potter of considerable talent, and Richard Lunn, who taught at Camberwell as well as the RCA. Here’s a list of some early manuals published before Billington’s “The Art of the Potter”. Samuel Fletcher, A treatise on the art of enamel painting on porcelain etc. M.E.F.Rebouilleau, Manuel de la pientre sur verre, sur porcellaine, etc. Keramic Studio. A magazine for the china painter, potter and student of design. Taxile Doat. Grand Feu Ceramics. The size of the pottery-painting craze can be judged from the increase in the number of manuals and guides published in the 1870s and 1880s: 5 between 1850 and 1869, 29 between 1870 and 1889, 12 between 1890 and 1909 and 7 between 1910 and 1929. My list may not be comprehensive, but the trend is unmistakable. It was between 1910 and 1929 that studio pottery emerged in Britain (although were parallel movements in France and the USA that we insular Brits tend to overlook), and so it is understandable that the pioneers felt they were in a new land without maps. The manuals published after 1900 tended to be more about clay and less about painting than those of the 1870s and 1880s. I have found 7 manuals from the 1930s, where my survey ends. In 1940 Bernard Leach published “A Potter’s Book”, a revolution in craft pottery, based on Japanese and English country pottery rather than Stoke-on-Trent and the drawing room. Leach inspired a generation of potters, amateur and professional, and in the 1960s, 70s and 80s the number of pottery manuals increased again, most in the Leach tradition, and more books were published than ever before. Nicos Anastasiades, the Cypriot president, is to open a retrospective of the work of Valentinos Charalambous, Cyprus’s leading ceramic artist, on 22 November in Limassol. It runs until 29 December. The exhibition celebrates Valentinos’s sixty-year career. (Full details at the bottom of this post.) Now aged 86, he works in his Limassol studio every day. I visited him there to talk to him about his life and work. Having been brought up in a pottery he can’t take a rosy view of the traditional potter’s life. It was hard. His father didn’t want him to do the same sort of work – in fact, he forbade him to enter the pottery. Valentinos came to London to learn decoration but soon found he couldn’t decorate without making. As he had grown up with the craft he found it easy and learned to throw well. He graduated from the Central with distinction and soon found outlets for his work, exhibiting at the Festival of Britain and the Crafts Centre of Great Britan, a major venue in the 1950s. But he had no money, had to earn a regular living and felt a responsibility to his family. And so he returned to Cyprus. Back in Famagusta he worked alongside his father, combining his London training with an understanding of Cypriot forms and motifs. 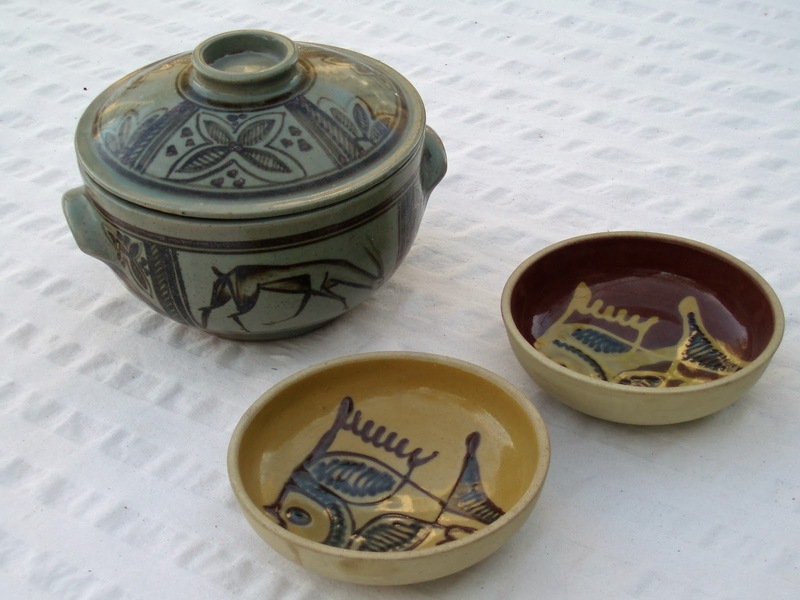 He had to set aside his ambition to make individual pots and was compelled to make commercial, decorated pieces, (below) using local clay, throwing eight hours a day. There was no tourist market so he sold to British government and military personnel. Decoration was a new departure for the pottery. In 1955 the EOKA military campaign against British rule in Cyprus began, which also targeted Cypriots who were considered to be collaborators. His British acquaintances (who included Freya Stark and Lawrence Durrell) did him the favour of staying away from the pottery. Fotunately he had orders from Heal’s, Fortnum and Mason and Harrods; but in 1956 the Suez Crisis and difficulties in the port of Famagusta made exports impossible. In 1957 he was offered a job teaching ceramics in at the Institute of Fine Arts in Baghdad and jumped at the opportunity.”It was a godsend,” he told me. Ian Auld, who had taken over from Valentinos as technician at the Central, had set up the ceramics department there but left after two or three years. 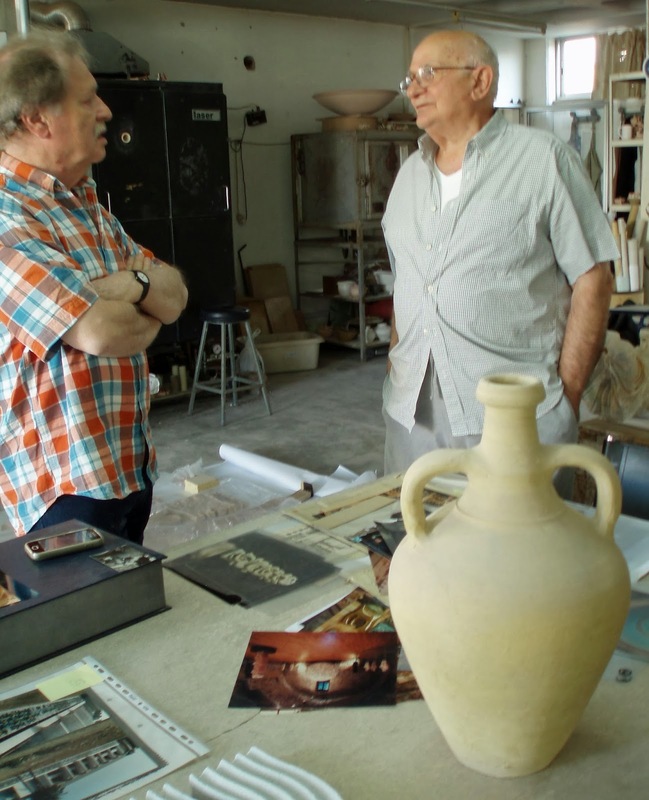 Valentinos arrived in Baghdad in a heatwave and sandstorm and almost turned back, but he stayed for thirty years, teaching leading Iraqi ceramicists including Saad Shakir. He was happy in Baghdad and developed a love for the Arab world, feeling an affinity with the Islamic way of life. He kept up his connections in Cyprus, returning to the island for several months a year but he eventually lost his contacts in Britain. As a consequence his work is well known in Cyprus and the Middle East but less well known here. In Baghdad he began to make murals. His first large work was for Nicosia International Airport (now closed). Commissions for Cypriot hotels and companies followed and then a commission for the Iraqi Officers Club – a large mural, 65 metres long and a difficult commission, politically sensitive and a major technical challenge. Shrinkage had to be carefully calculated. He was out 1.5% in his calculations, which doesn’t sound much, but over 65 metres that meant an error of one metre. And the client kept changing his mind about what he wanted. Murals have been a constant theme in his work ever since. He makes what he knows he can sell but doesn’t work to commission any more because he doesn’t want details to be dictated by the client.The forms of this mural in progress in his studio (left) include Arabic elements: the Hand of Abbas (a Shi’ite motif) and motifs drawn from the embroidery of the Marsh Arabs of southern Iraq whose free way of life he admires. 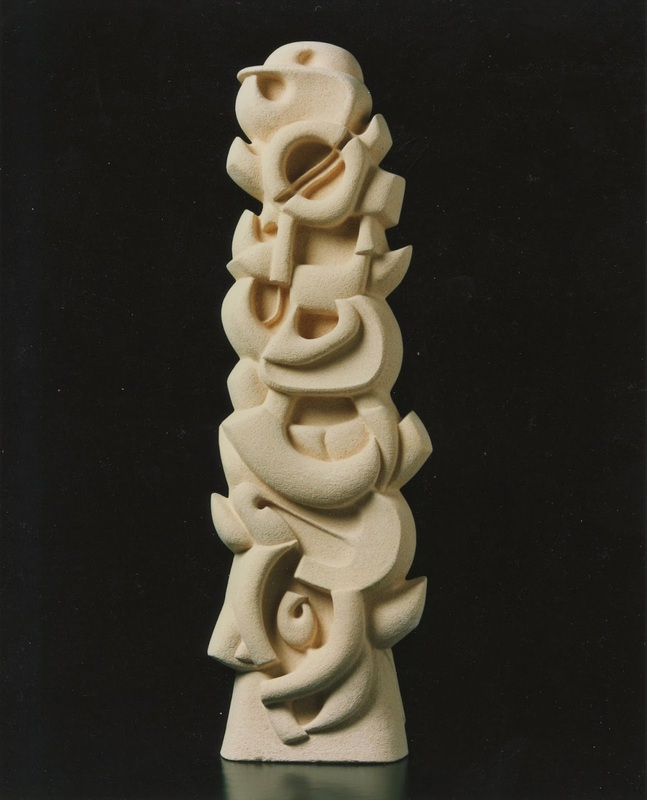 Similar rhythms occur in free standing sculptural pieces like the one at the top of this post. There he embodies elements from language, seeing an analogy between classical Greek prosody, based on the alternation of long and short vowels, and the long and short strokes of Arabic script. 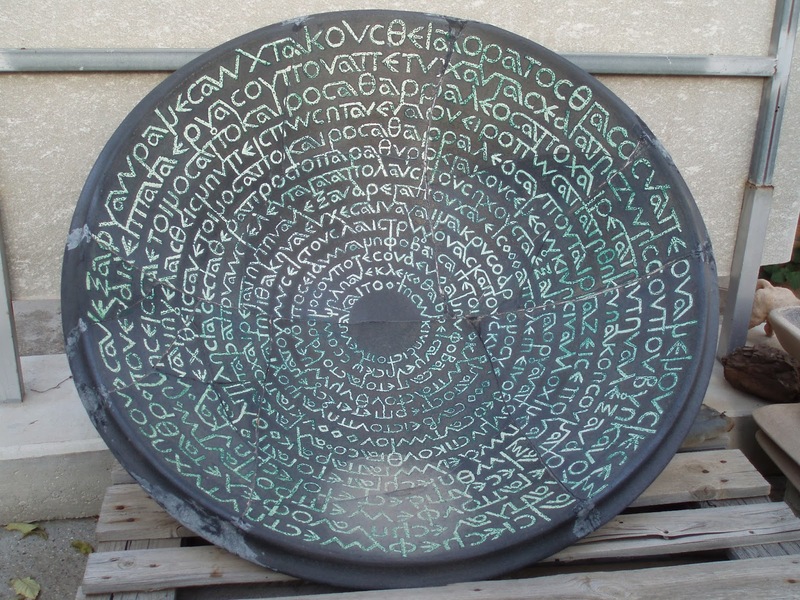 In recent years his interest in language and ceramics has been expressed in large dishes with lettering, as in this dish (below), about 75cm in diameter, which uses the poetry of Cavafy, inscribed in a way that is primarily decorative and which is meant to be hard to read. After the Turkish invasion of northern Cyprus his father’s house in Famagusta was destroyed and the district he grew up in, Varosha, became a ghost town. “I was chucked out of Famagusta and I was chucked out of Baghdad,” he says, and then corrects himself: he chucked himself out of Baghdad because conditions in Iraq had become so bad after the Iran-Iraq war. Valentinos’s big studio is full of work in progress, including glaze and body tests with celadonite, a curious mineral that occurs in the Troodos mountains with a colouring oxide that looks like copper but which is in fact iron. The pressure of work and teaching means he can’t spend as much time as he would like on this research. As he doesn’t like to be disturbed when he’s working, the studio is unmarked and the door is closed if he’s not expecting visitors. 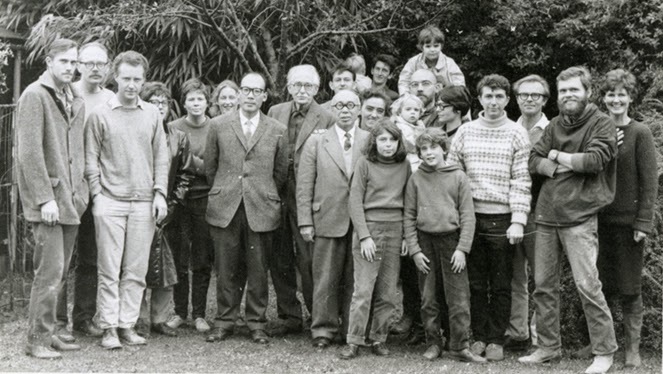 He has several students, including Marina Pieridou, the person who introduced me to him. A monograph on his work, based on conversations between Valentinos and Marina, is in preparation. Valentinos is an enchanting and generous man who puts a great depth of knowledge and breadth of experience into his work. He has had a happy life, he says, and would change nothing if he had to live it again. VALENTINOS: CERAMICS – past and recent creations. 22 November 2013 – 29 December 2013. Carobmill of Evgoras Lanatis Centre, Queen Berengaria, Limassol, Cyprus. The ceramist Kenneth Clark died last month at 89. He occupied a rare position between studio pottery and industrial ceramics, running a small workshop and carrying out design commissions for architects and large potteries. He taught at the Central School of Art (now Central St Martin’s) and at Goldsmiths (whose ceramics course is long gone). I always admired the breadth and openness of his vision. As well as running his workshop, his design consultancy and teaching, Kenneth Clark wrote books for people starting pottery, which approached the subject in the systematic manner of the good educator. His best-known book was The Potter’s Manual, but I started on an earlier book, Practical Pottery and Ceramics, published in 1964 and still available on the second hand market. The introduction sets out his approach clearly and is so good that it’s worth reproducing in its entirety. “People beginning ceramics in the post-war era have inherited the sound tradition established earlier by Bernard Leach and his followers; and Bernard Leach, in his turn, was inspired by the works of Morris and Lethaby, to whom ‘truth to materials’ with all its implications was of prime importance. “Today, there are a number of ceramists, Lucy Rie amongst them, who are continuing to enrich this tradition by producing individual pieces of domestic ware in a highly personal style. But, with all the great changes – social, economic and artistic – that have taken place since World War II, how many ceramists have sought to extend tradition to meet the new needs and conditions of the present day? “When the restrictions of war and rationing were over, the great cry and demand was for colour, to be used with daring and verve in ceramics, fabrics, interiors and a host of allied fields and activities. With this desire for colour there developed a greater appreciation of natural surfaces and materials, from wood to stone, where textures blended and contrasted. No longer were purely individual pots, and, to a limited extent, hand-made domestic ware the only accepted products of the potter. There were new uses and far greater opportunities for ceramic work than before. “During this period of change Picasso with his daring, invention, colour-sense and imagination, shattered and shocked the traditionalist potters with his experiments in ceramics. While his approach was obviously more that of the painter, he added fresh life and a new direction to ceramics, and from his activities stemmed many schools of thought and expression which flowered in the ‘fifties. 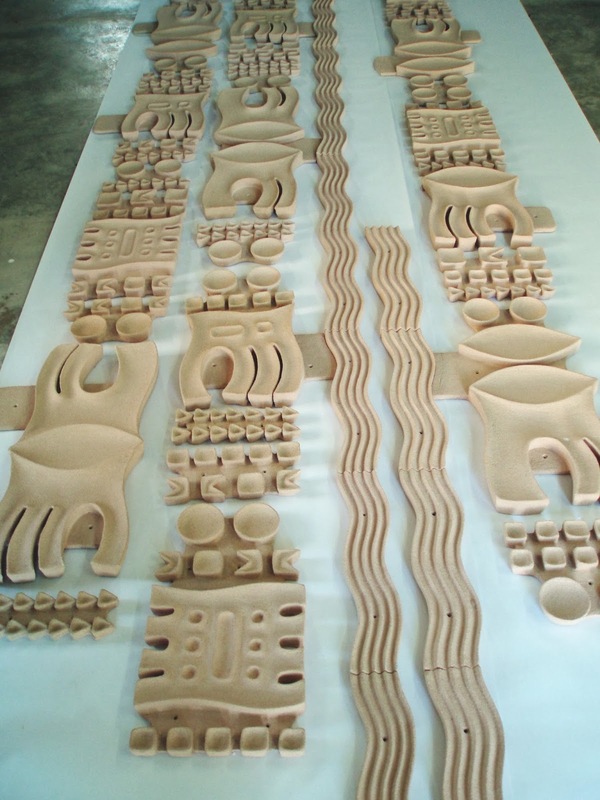 Ceramists found that their values needed drastic revision, while at the same time they endeavoured to retain an openness of mind and an integrity in the use of their materials. “Was British industry alive to what was happening, and did it revitalize its tradition with fresh ideas and imaginative thought? Alas, with few exceptions, it does not appear so, nor were most of the individual potters prepared to co-operate, when industry ignored – and still ignores – them and the contribution they could make. As a result, the world now wants only our traditional wares, and shops elsewhere for good modern design. “Now let us look at what has happened beyond these shores. In Scandinavia, management has used ideas intelligently, and employed the best potters, consequently gaining them a world-wide reputation. In Japan the work of the potter is prized above that of the painter, and the proceeds from the sale of one pot can supply all the needs of a distinguished potter for at least three months. In America there is a demand for imaginative and lively ceramics; and in Australia, we are told, the demand for individual pottery far exceeds the supply. “Here in England many small industrial firms have closed or been forced to merge with others, in order to survive economically. And science, in the name of uniformity for mass production, has eliminated much of the natural richness and variety in many raw materials. These added factors, combined with competition from plastics, make it essential that ceramists should have a high standard of design – but this has yet to be achieved. “Too few of us are alive to the implications of living fully in the present. Yet, today the ceramist may be commissioned to supply, say, large pottery containers, individual pieces for a board room, perhaps an external ceramic feature for a wan, even asked to advise on suitable ware for the restaurant or canteen; and all for one client and one building. Here, surely, is a cue for the future; there is a growing demand for the variety and richness of ceramics that few other materials can replace.